I'm on my fourth batch of macaroons for Passover. Love these because they're gluten-free but also because they're probably the easiest dessert I'll ever make. I don't know why I don't make them all year round, as what other cookie takes about 10 minutes to prepare? Each time I make them, I add something different. I started off with lemon peel and vanilla extract. Second time, I subbed the vanilla extract for almond extract. Third time I used orange peel. And this last time, I added a little rose blossom extract, just because I'm always trying to think of things I can do with that bottle on my shelf. 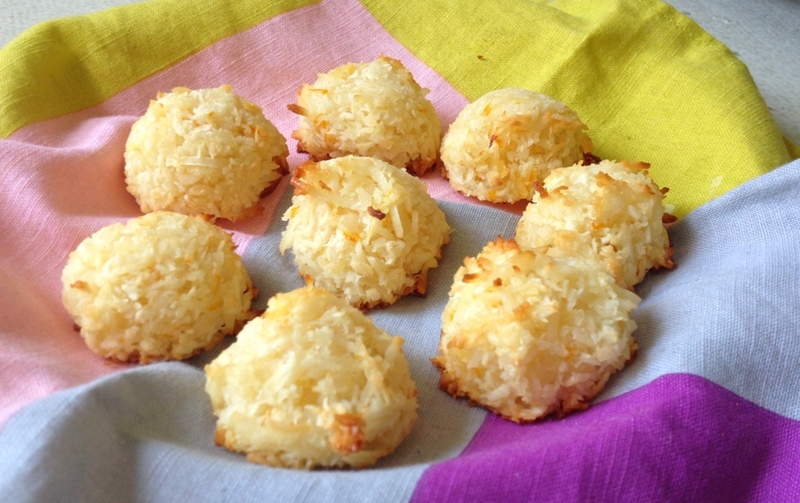 Get creative when you make your own macaroons! Sprinkle chocolate on the top. Add crushed pistachios or almonds. Try lime peel. And don't just save them for Passover, especially if you're gluten-free. Preheat the oven to 325 degrees. Line a baking sheet with parchment paper or cover with Silpat. Stir together the egg whites, sugar, orange zest, almond extract, coconut and a pinch of salt until combined. Using a small ice cream scoop or a tablespoon, drop onto the baking sheet. Bake 15-20 minutes, until the tops are pale gold. Transfer with a spatula to a rack to cool.